This dataset includes Centers for Disease Control and Prevention (CDC) information related to state legislation on smokefree indoor air in various areas per state. 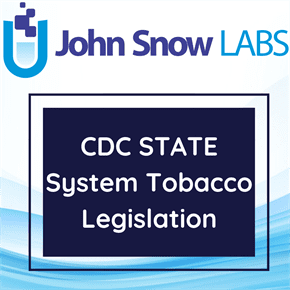 The State System houses current and historical state-level legislative dataset on tobacco use prevention and control policies data are reported on a quarterly basis. This dataset includes information related to state legislation on smokefree indoor air in areas such as: Bars, Commercial Day Care Centers, Government Multi-Unit Housing, Government Worksites, Home-Based Day Care Centers, Hotels and Motels, Personal Vehicles, Private Multi-Unit Housing, Private Worksites, Restaurants, Bingo Halls, Casinos, Enclosed Arenas, Grocery Stores, Hospitals, Hospital Campuses, Malls, Mental Health Outpatient and Residential Facilities, Prisons, Public Transportation, Racetrack Casinos, Substance Abuse Outpatient and Residential Facilities. The primary purpose of smokefree laws and policies is to protect nonsmokers from secondhand smoke. However, smokefree laws can also motivate and help tobacco users quit and prevent initiation of tobacco use. Studies have shown that the implementation of smokefree laws and policies can increase cessation and reduce smoking prevalence among workers and the general population and may also reduce smoking initiation among youth.